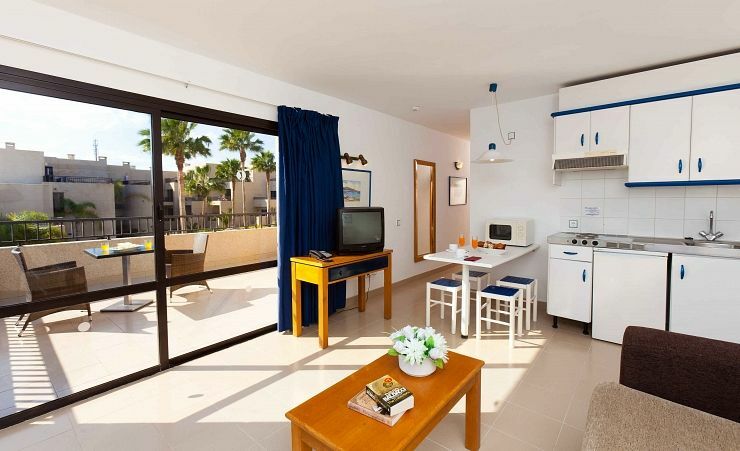 In a peaceful part of the seaside resort of Costa Teguise you get the best of everything. The lush green garden setting makes this one of the loveliest places to stay on the island. But even here in the midst of all this lovely scenery, you're only 15 minutes away from the heart of Lanzarote. 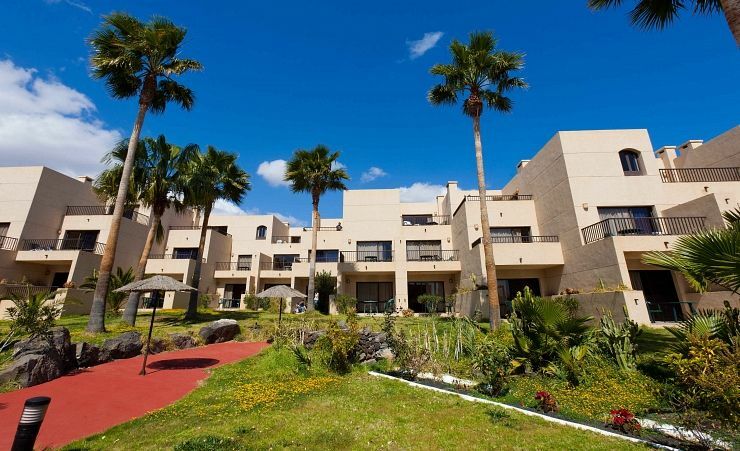 The Aparthotel Blue Sea Costa Teguise Gardens is within easy reach of shops, restaurants, bars - and lots of lovely sandy beaches. There's a real feeling of fun at this aparthotel. The fresh, light decor, family-friendly layout and wide open spaces make it a great looking place to stay with a really inviting atmosphere. It's a very comfortable choice of accommodation too. Take a stroll in the gardens and you'll pass by very inviting hammocks and sun loungers to tempt you. There's nothing lovelier than being able to stretch out in the sun or the shade and let life pass by at holiday pace. Apartments marry style and comfort. There's some local colour in the rooms too - and throughout the hotel. Furnishings are of a high standard, and the spacious en suite apartments include kitchenette, lounge area and a balcony or terrace. (Another great place to sit and watch the world go by.) 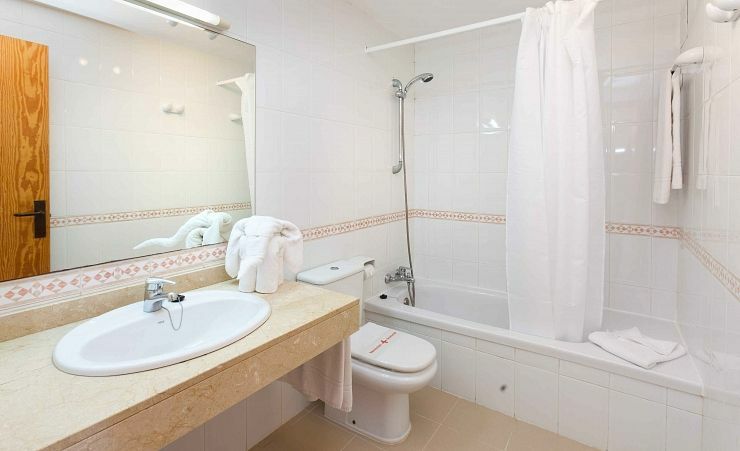 You'll be well catered for with home comforts including satellite TV, telephone and safe*. 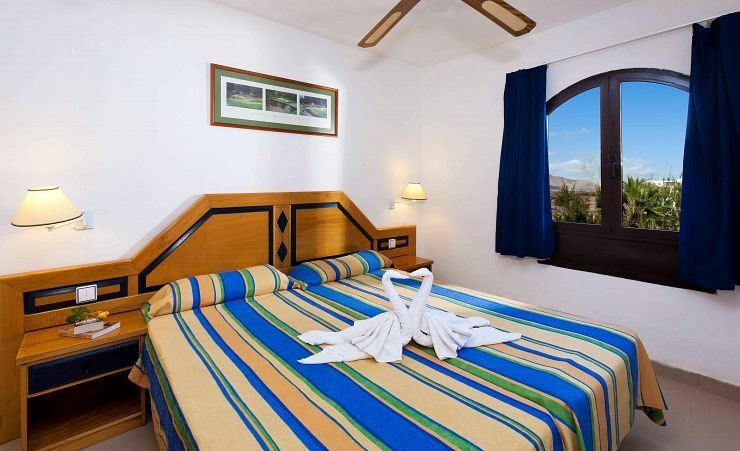 The Aparthotel Blue Sea Costa Teguise Gardens gives guests plenty of options to have fun. 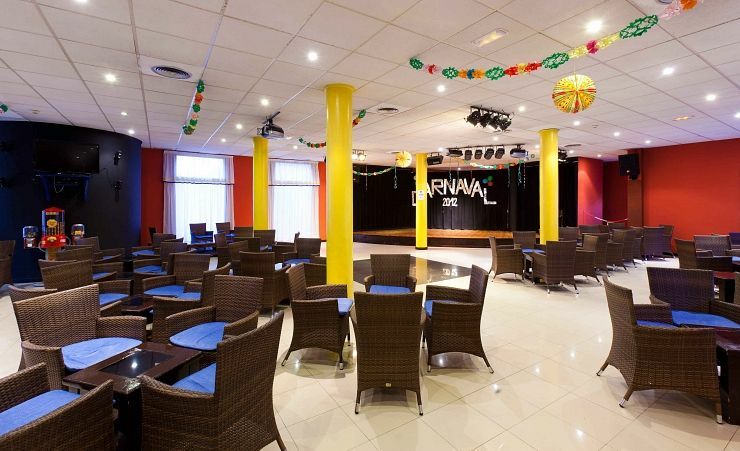 There's regular live entertainment on the bill, as well as a games room and sports court. That all helps keep the relaxed friendly atmosphere going. Step into the pool area and you'll also find a snack bar - another great place to get together with friends and take it easy. 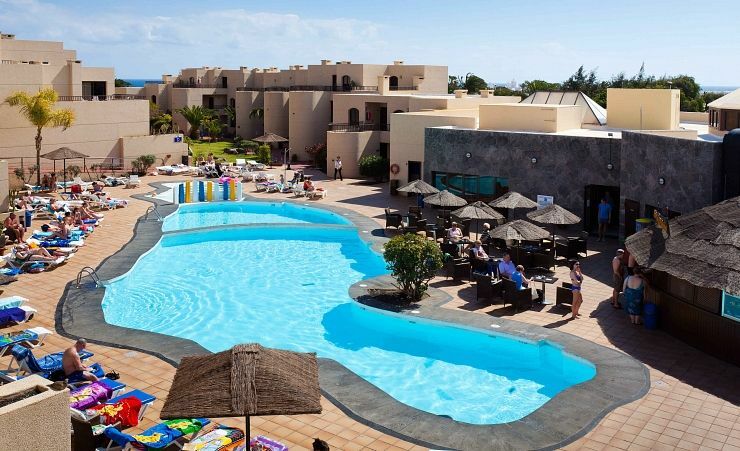 With so many lovely sandy beaches to choose from - all within easy reach - and a host of popular tourist attractions, the Aparthotel Blue Sea Costa Teguise Gardens occupies a great location in one of Lanzarote's favourite resorts. On Lanzarote’s eastern coast is the coastal town of Costa Teguise, one of the major resorts on the island. Intentionally built for tourism, Costa Teguise has a wide range of sights and attractions including four natural sandy beaches, numerous restaurants offering everything from traditional Spanish Tapas to international themed dishes, and a lively nightlife. Costa Teguise enjoys a pleasant, warm climate all year-round but temperatures are the warmest (29°C) in August. But, this is also when humidity is at its highest. Pueblo Marinero, a traditional style fishing village, is a great place to walk around with numerous shops, bars and restaurants and a weekly market held on Wednesdays and Fridays. At the market you’ll find locally crafted goods and occasionally live music. If you’re interested in art or architecture, Fundacion Cesar Manrique Museum is a must-visit. Tickets are inexpensive and, once inside, you can explore his home, his art and even lovely surrounding gardens. There are four natural beaches in Costa Teguise, all with watersports available. While windsurfing is hugely popular throughout the resort, it’s best experienced on Playa de las Cucharas. If you’re looking for a more laid-back day at the beach, head to Playa Bastian or Playa de los Charcos, both of which are easily accessible and are protected from strong winds. Of all of the beaches, Playa del Jablillo is the smallest, but it’s clear turquoise waters are perfect for fishing in. 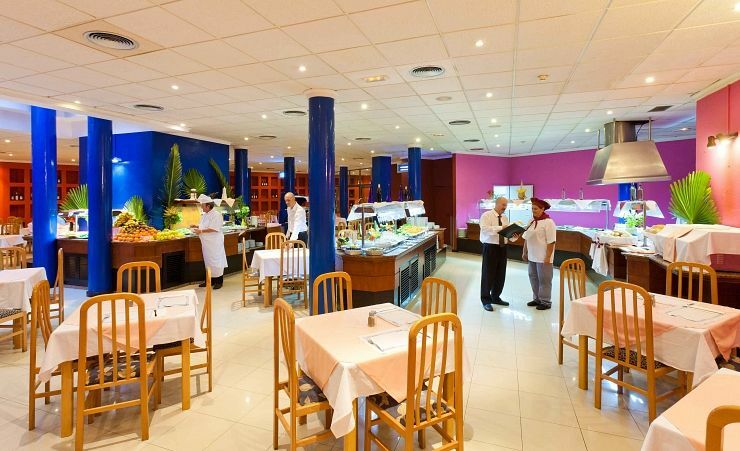 Whether you’re looking for something cheap and local or are more interested in fine dining, you’ll find something in Costa Teguise. For a delicious afternoon seafood snack, go to Habana 6. Its relaxed atmosphere, local food and friendly staff make it a must-visit. If you’re looking for something a bit hardier, try The Grandfather Steak House Bar where you’ll find moderately priced specials and wine by the bottle. If you want to eat like the locals do, try El Guachinche de Luis and for a classic English Breakfast (and a pint) head to Tekkers Family Bar & Restaurant. 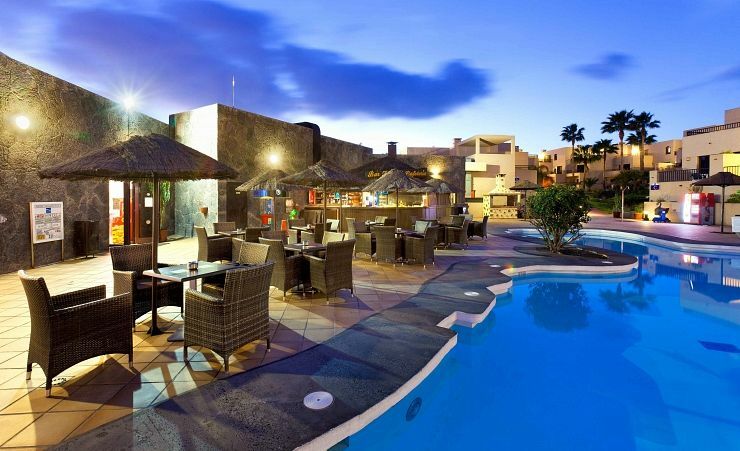 Costa Teguise is the perfect place to let loose, with karaoke, discos, pubs, live music and more. Drinks and tapas are inexpensive and the atmosphere is lively in Pueblo Marinero, where you’ll find numerous bars and restaurants. While here, you can people watch in the Square or sit down for a few in The Irish Eye. If you’re looking for a laugh (and something different), head to Lively Lady Show Bar. Family-friendly shows featuring singing and dancing drag queens attract tourists from all over the world. While Costa Teguise is lacking in terms of history, there are plenty of cultural celebrations to enjoy throughout the year. In September, don’t miss the Costa Music Festival where you’ll be able to hear sounds from around the world and in June, dance and drink with locals at the Brazilian Music Festival. Travellers flock to Costa Teguise for its recreational facilities, including a water park, golf course and windsurfing schools. Of course, you’ll also find opportunities to scuba dive, snorkel and fish on the various beaches. Located just 10-15 minutes from the airport, it’s easy to reach the resort by taxi or shuttle bus. Once settled, walking is pleasant and, from the resort, you’re only about 10 minutes away from the Square. If you’re looking to travel a bit further, there are also public busses and day trips can be easily organised with private transportation. I LOVED THE RESORT AND HOTEL. THE EXCELLENT ACTIVITY and , COORDINATOR - HOSE' AND ALL THE STAFF FROM RECEPTION TO THE THE GROUNDS MAINTAINERS, the RESTAURANT, WAITERS, CHEFS KITCHEN, APARTMENT AND HOTEL CLEANERS were efficient, helpful, friendly, constantly busy but always quick with a smile and a greeting. The all inclusive was excellent value, lovely plentiful and choice of food and drink. The hotel was well maintained and the apartment very good. I want to return as soon as possible!